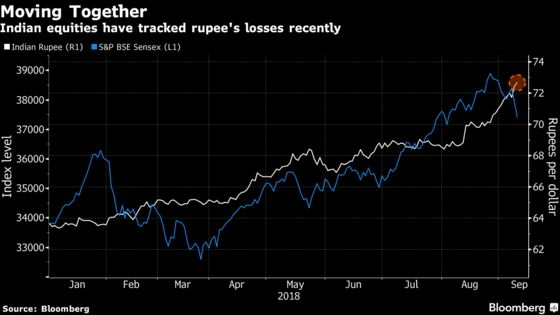 (Bloomberg) -- India’s rupee has been battered along with its emerging-market peers in recent weeks, but stock investors would do well to look beyond the currency’s slump and pay attention to an improving earnings picture, according to the nation’s largest brokerage. Indian equities have lost about $89 billion since rallying to a record on Aug. 28 as the rupee set a string of lows amid a selloff sweeping most emerging markets. The currency’s slide, she said, follows a “long benign period of stability,” and indicators including robust consumption and a pick up in loan growth show the economy is on the mend after the shocks of a cash ban and the introduction of a nationwide consumption tax. About three-fourths of Nifty 50 index members reported results that either beat or met profit estimates in the June quarter, the highest proportion in at least three quarters, according to calculations by Bloomberg Quint. Last month, data showed gross domestic product topped 8 percent, putting the nation ahead of China, where an intensifying trade spat with the U.S. is hurting growth. While India’s world-beating economic expansion faces risks, most notably from oil prices -- and its impact on the rupee -- it is unlikely that stocks would “move down too sharply” solely because of a weak currency, Kumar said. The rupee’s slide has more or less accounted for the overvaluation seen in the past two-to-three years, according to Kotak Mahindra Bank. The rupee has slid about 15 percent against the dollar from the taper-tantrum period in 2013, significantly less than other big emerging markets, the lender said in a note. ICICI’s Kumar is staying bullish on Indian stocks. “I don’t think there is a trigger for it to fall given that indicators point to the earnings finally beginning to show up,” she said.